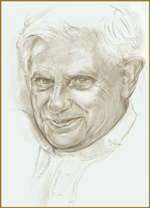 The Portrait of Pope Benedict XVI on the above is by artist Danielle Vergne. Pope Benedic XVI Portrait - Stained Glass Pattern - This pattern was made tocommemorate the selection of Pope Benedict XVI, on April 19, 2005.The picture was made from a photograph of the new pope emerging from the balcony in St.Peter's square. Benedict: What's in a name? Benedict -- What's in a Name? by Marcellino D'Ambrosio, Ph.D.
A new interview with Cardinal Ratzinger - The following extract is from a recent interview with Cardinal Ratzinger published in the widely distributed Italian magazine, 30Giorni, No.1, January 1999. Communio: A Program 19, no. 3 (1992), 436-49. Interreligious Dialogue and Jewish-Christian Relations 25, no. 1 (1998): 29-41. The Holy Spirit as Communio: Concerning the Relationship of Pneumatology and Spirituality in Augustine. 25, no. 2 (1998): 324-339 RT. The Theological Locus of Ecclesial Movements 25, no. 3 (1998): 480-504. Thoughts on the Place of Marian Doctrine and Piety in Faith and Theology as a Whole 30, no. 1 (2003): 147-160. Introduction to Christianity: Yesterday, Today, and Tomorrow 31, no. 3 (2004): 481–495. 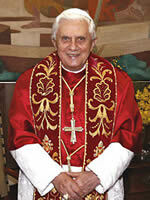 Funeral Homily for Msgr. Luigi Giussani 31, no. 4 (2004): 685–687.